NOTE: The TAP was actually intended for PVRs sold in Germany. old RCUs (e.g. TP006 of 5000 series and other Mode 4 RCUs). What is AcadeRC able to do? 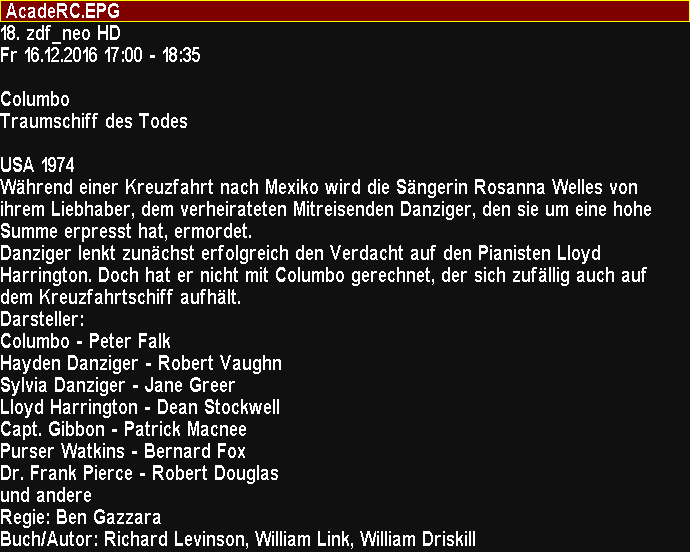 Playback HD .rec files without .nav with pausing etc. File browser direct key default changed to "Ok"
Infos & Tools direct key default changed to "Subtitle"
Browser direct key default changed to "Filelist"
New: Alternative TAP key "TvSat"
New: Optional start mode "Listen"
so it is the first TAP to be started (name e.g. 000_acaderc_tms.tap). This is essential for passing remapped keycodes to the system and other TAPs. All the other accompanying files belong to ProgramFiles/Settings/AcadeRC. version and its required components. Interception functions, the last tiny and 5K version (acaderc-2.30.zip) is included. As usual, the TAP is started manually or from the AutoStart folder. The "TAP key" is by default the "Sat" key (optionally the "TvSat" key). TAP, the original meaning of the TAP key can be retained by pressing it twice. being called (mostly in own TAP sub-windows), e.g. the TAP menu. Any TAP sub-window will be closed by pressing the "Exit" key. 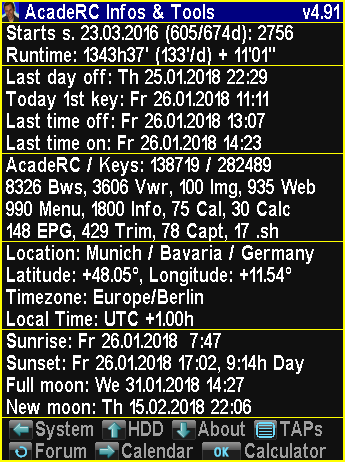 Ok on "Show Key Codes"
Ok on "Show System Infos"
navigate there by "Up / Down", change values by "Left / Right", press "Ok"
to open a sub-window and "Exit" to leave again. "Language =" selects the language used throughout the TAP. "Font Size =" selects the font size used throughout the TAP. "Start Channel =" selects the channel number to start with. and a zero value means "channel at last power-off". 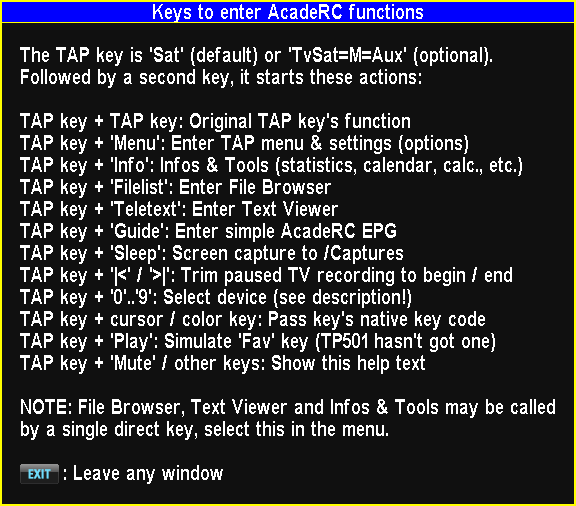 "TAP Key =" selects the TAP key ("Sat" or "TvSat"). 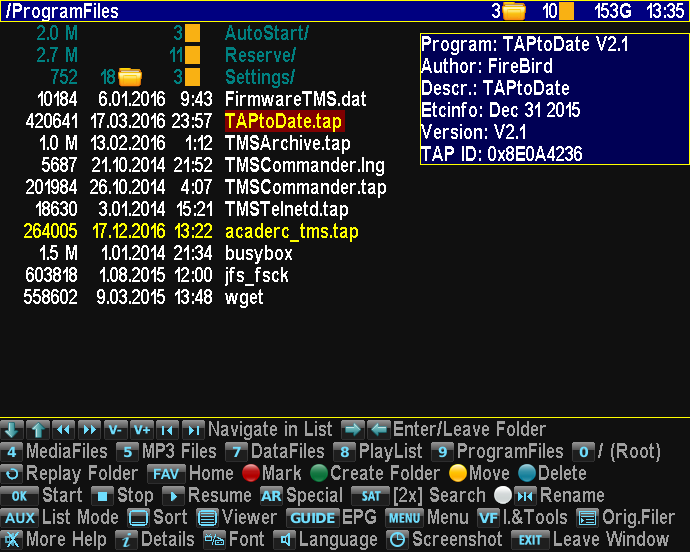 It is active immediately after "Save & Exit Menu". The default is "Sat". the indirect "TAP key" + "Filelist"). "Filelist" or "Ok" may be selected. 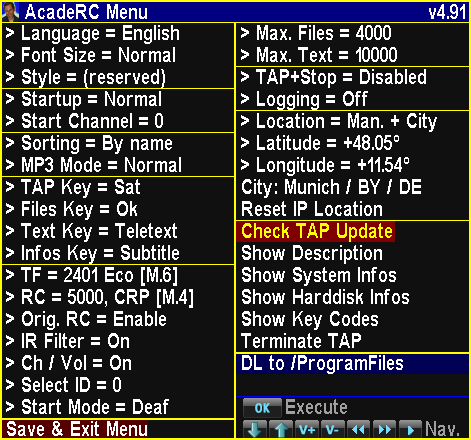 the indirect "TAP key" + "Teletext"). 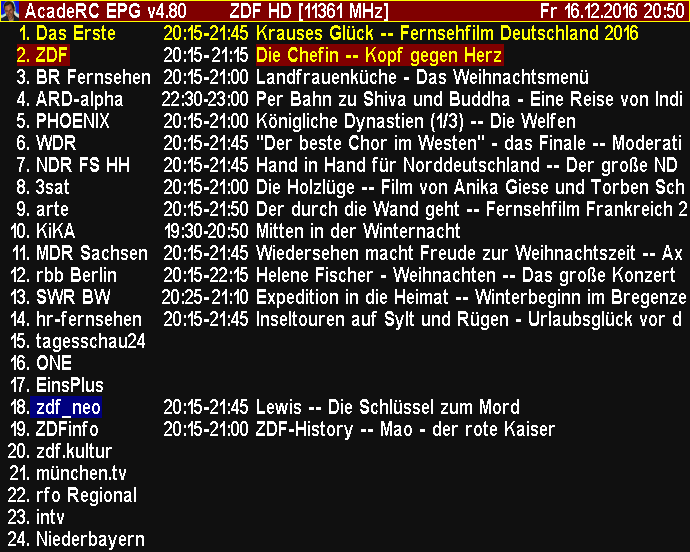 Only "Teletext" may be selected. the indirect "TAP key" + "Info"). "Subtitle" or "Info" may be selected. "RC =" selects a (replacement) remote control type (may be same as PVR). At both menu items, the effective IR Filter mode is indicated [M.*]. "Orig. RC =" disables / enables the original RCU's IR signals. "IR Filter" must be turned ON only, if PVR and RCU are different, i.e. if you want to use a replacement RCU. the 5K has no extra keys for Ch/Vol and uses the cursor keys). if multiple receivers are controlled by only 1 remote control (see below). If not equal 0, the device can only be accessed again (after "Save & Exit"
and after every restart of the PVR or the TAP) by "TAP key" + "ID/0". "Listen" is a special user request (always selected after restarts). the time of entering the menu are retained. "Max. Files" sets the max. number of files in the file browser's list of files. which should be quite sufficient. range from 5000 to 100000, its default is 10000 lines per document. be restarted to make the new setting effective. running TAPs (except AcadeRC itself). "TAP+Stop = PVR Off" additionally powers the receiver off using this sequence. So you can switch off without using the Power buttun. This is interesting with a SelectID (see below) to power off only 1 receiver. 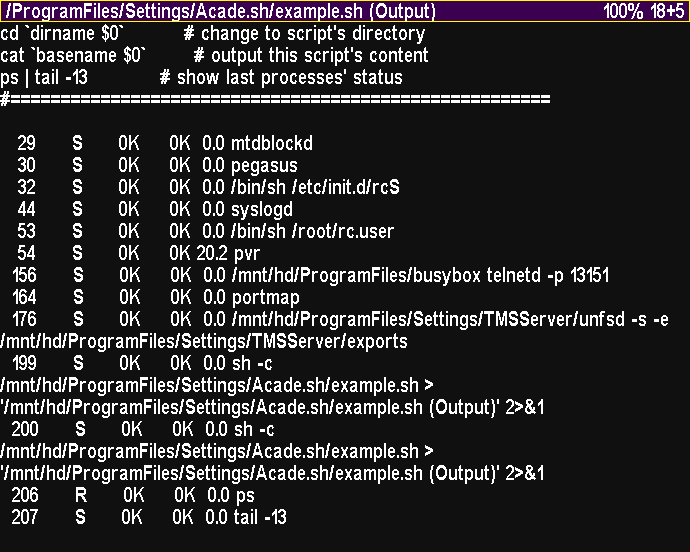 "Logging =" switches on/off additional output to the logfile (acaderc.log). 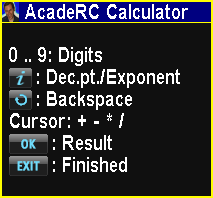 AcadeRC, its description or other components are available. is stored in the ProgramFiles folder, *** being an incremental number. like codecs listing, HTTP download or HTML and PDF display. without any changes in the receiver for the TAPs. "Show Description" displays this documentation in the text viewer. "Terminate TAP" ends execution of the TAP. Character input is done in SMS style, operation is intuitive. unused key and the "Mute" key, which is reserved for this purpose. and may also disable the extensions filter. This temporary sorting mode can be made permanent within the menu. levels, sub-directories and files, as well as occupied harddisk space. TAP key + Info generates a recursive directory listing as text file. which is seen here as a normal text file, that can be stored. On image files, it shows their size and, if given, the JPEG comment. On .mp3 files, it shows their parameters and ID3v1 tag, if present. 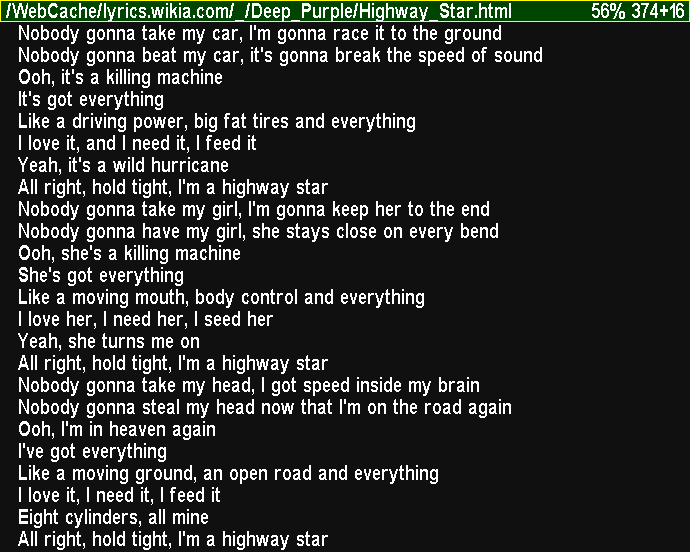 If a lyrics server is available via internet, its response is preferred. the "Recall" key is reserved permanently. The above mentioned toggling mechanism applies to it as well. For other directories, the digit keys in the above list are reserved. displayed, defaulting to the bookmarks file. 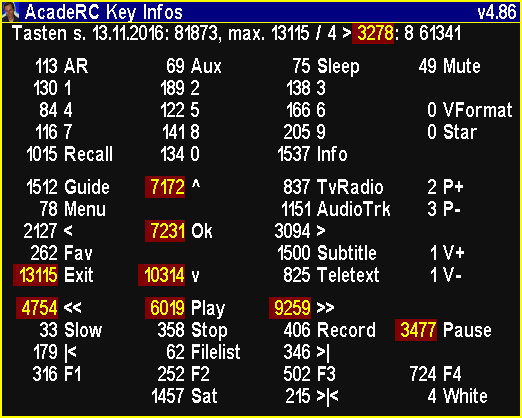 the "Teletext" key is pressed within 0.5 seconds. to the previous document (same as the "P-" key). 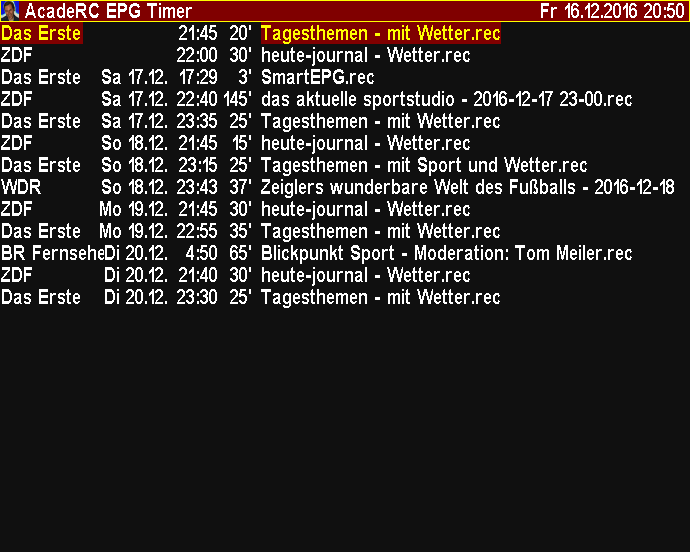 the replay file's EPG infos are shown as new document. A HOME document may be set by "F1 (Red)" and be opened by the "Fav"
key. However, there is no toggling mechanism as in the file browser. 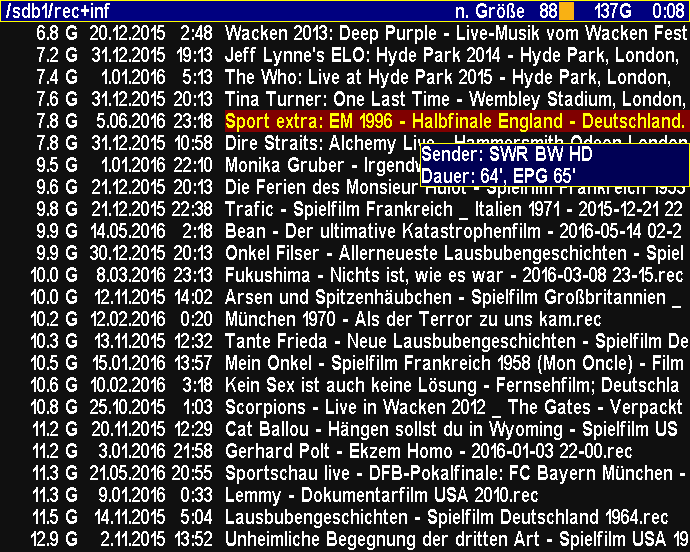 Instead, there is a text viewer history, available by "P-" and "P+". permanently. "F2 (Green)" appends a new bookmark to it," F4 (Blue)"
deletes a selected link from the bookmarks list. The image viewer is entered either from the file browser by pressing "Ok"
on an image file or by an "Ok" on a HTML image link within the text viewer. 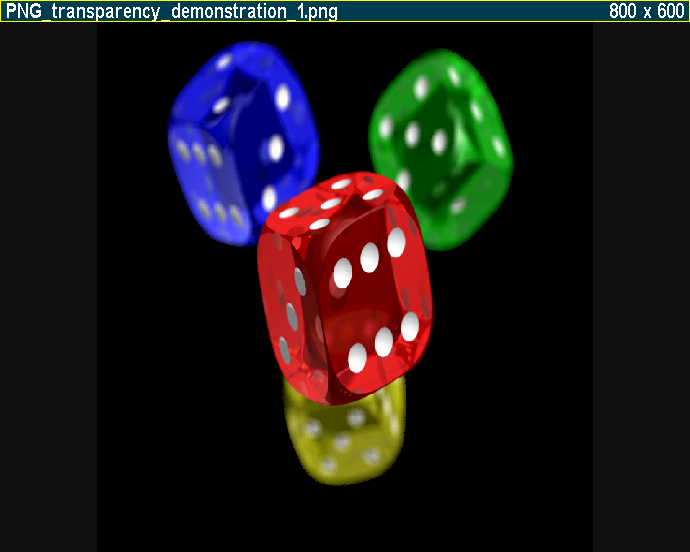 Currently supported image formats: BMP, GIF, JPG and PNG. from the internet over the HTTP[S] protocol. your PC's Firefox may be copied there and be used in parallel. its line position. At the moment, Bookmarks.html can be edited at your PC only. Currently it's (not yet) possible to enter an URL manually. Another way to download and open files from the internet is via the file browser. An "Ok" on a sub-folder within /WebCache gets the main document of e.g. oztoppy.forumchitchat.com and displays it in the text viewer. For how to operate the web browser, see the text viewer's key legend. 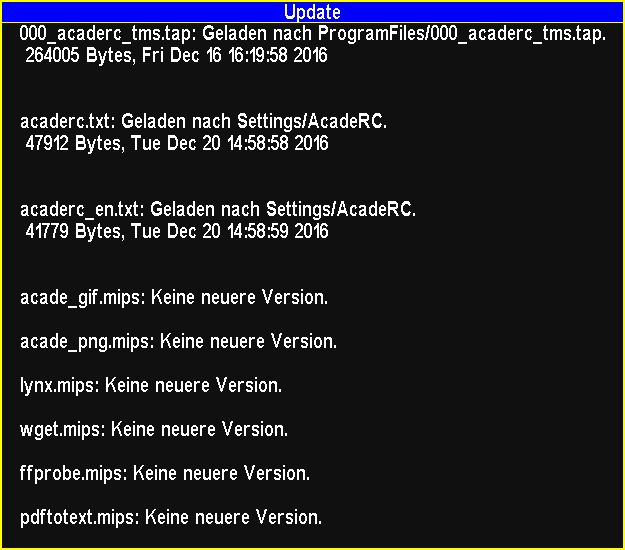 (lynx, wget), these can be obtained via the TAP's "Update" function (see Menu). 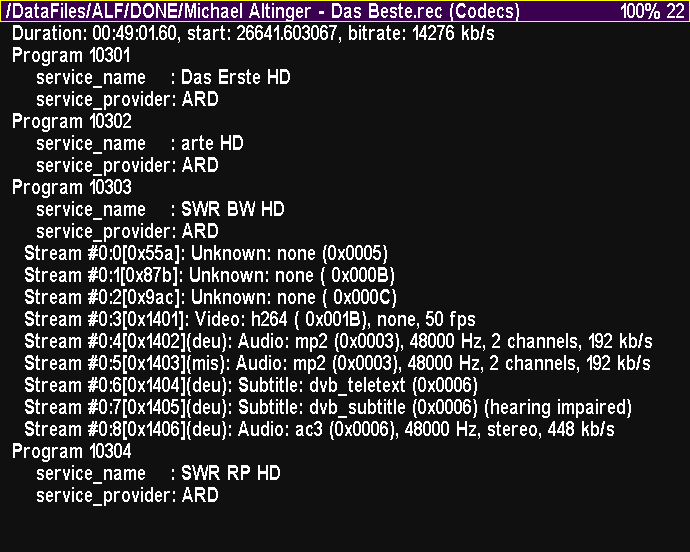 all subsequent (or with navigation also the preceeding) files in the same directory. is guaranteed, if other TAPs are following the symlinks during deletion). playlist itself, so you must not have a '/' or '\' at the beginning of a line. Comment lines are indicated by a '#' at the beginning of a line. /PlayList (symbolically) and starts to replay them. directory, i.e. to /PlayList in the case of replaying a playlist. may be selected. Pressing "Play" within /PlayList jumps to the next file. is possible: Pressing >| resp. |< jumps to the next resp. previous MP3 file. internet. Once saved, there is no internet access needed anymore for re-viewing. wanted text may be available in the then displayed HTML file for manual lookup. "Guide" or by "TAP key" + "Guide" from outside of any TAP. This is the main function of "Infos & Tools". starts e.g. by SmartEPG or other timers can't influence the data prematurely. TAP menu) manually to prevent falsified statistics by userless ;-) activity. 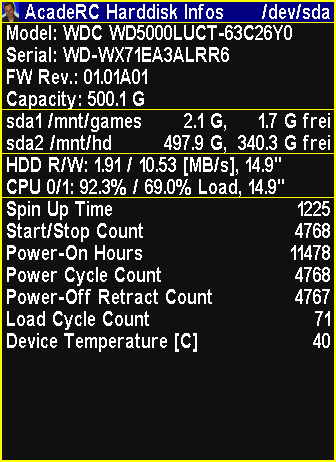 Display partitions, general HDD infos and non-zero SMART values. 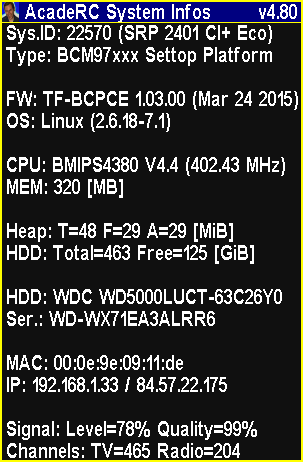 shows the infos of these disks (for USB devices only the partitions). key presses per key and by the keycodes. any other TAPs processing key presses, of course. Automatic key repetition (key kept pressed) is counted only once. AcadeRC was started before these TAPs (should be anyway). Calendar (1583 - 3000), 4 months per page. Simple calculator for basic arithmetic operations (was an Easter egg once). the computation. To backspace an item, press the "Recall" key. Operations can be chained, but without "*" "/" priority. If an operand is omitted, the last result is put in its place. one side. Then press "TAP key" + "|<" to cut from beginning or "TAP key" + ">|"
to cut to the end of the file. 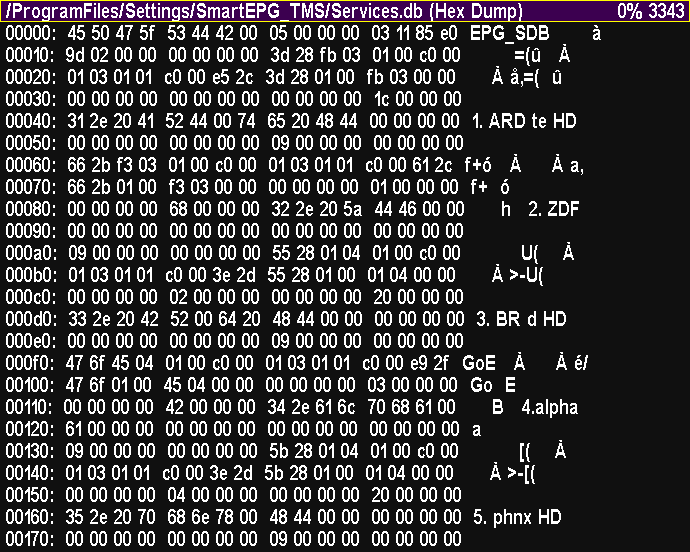 are stored in /Captures/PREFIX**.bmp. 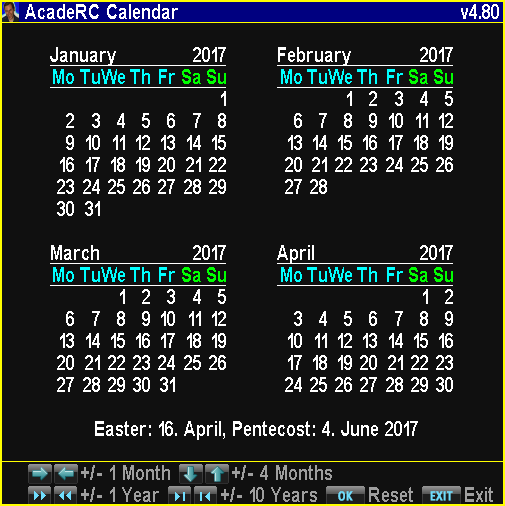 In AcadeRC sub-windows press "Sleep". PREFIXes are tap_, ttx_, video_ and acaderc_, depending on the capture source. Note: Video capture is only possible while the replay is running (not paused). AcadeRC must have been started before the other TAP, whose window to capture. This is the normal operation mode of AcadeRC anyway. In the file browser, the currently selected .sh file can be executed with the AR key. files are retained until you delete them. these will be executed automatically, when the TAP is started / stopped, respectively. Their output will be written in their respective output file. prefabricated, generally useful script files into an AcadeRC subdirectory. execute more than 1 script files in the subdirectories Autostart or Autostop. Their actions must be initiated by the user himself in any case. (see chapter "Remote Control Interception"), this may be disabled. a key sequence TAP key + 'Play' at any time. a key sequence TAP key + 'Pause' at any time. generated (empty, but with comments), if not yet existing. The amount of whitespace characters (spaces and tabs) has no effect. Optional fields may appear in any order after the first key code field. Lines contradicting the syntax are simply ignored. with their names as comments in the initial "AcadeRC.map". A missing target code suppresses the specified key. Conditions may be prefixed by a ! character for inversion. The 1st matching rule is being applied. This was originally the TAPs prime function. to control both receivers with this one RCU simultaneously, so I wrote this TAP. same time (or only one of them) with all available keys and same functionality. TF 5000, TMS 2100, SRP 2410, SRP 2401 (incl. Eco); CRP 2401 not tested. Every receiver should be completely controllable with other TF RCUs. ("TF=", "RC=" and "IR Filter" must be set explicitly in the TAP menu). By default, the 4 cursor keys are remapped to "Channel / Volume" "Up / Down"
keys, this behaviour can be switched off in the TAP menu. While in menus or other TAPs, the cursor keys keep working as usual. of a replacement remote control are recoded correctly for the target device. remain available by prefixing the TAP key before these keys. The original remote control can be deactivated in the TAP menu. The icing: If you have several receivers, you can assign a unique "Select ID"
different "Select ID") will then ignore any key presses, until they are selected. (e.g. if you have forgotten a receiver's ID). By default, this feature is turned off ("Select ID = 0" in the TAP menu). in order not to put all other receivers into their opposite ON/OFF state, too. But since v4.89 there is the "TAP+Stop" setting (see above) to power-off. within the folder ProgramFiles/Settings/AcadeRC, acaderc.log. A "Logging = On" setting (see menu) yields even more messages. press an arbitrary additional key before retrying the selection sequence. from the AutoStart folder (keep the "0" key pressed while powering on). (or delete even the whole AcadeRC folder) to get rid of the erroneous settings. configuration, appropriate combination of functions and additional features. not guarantee its correct functioning, use it at your own risk.